The company says REDS is the ‘alpha prototype’ of a new kind of electric car. 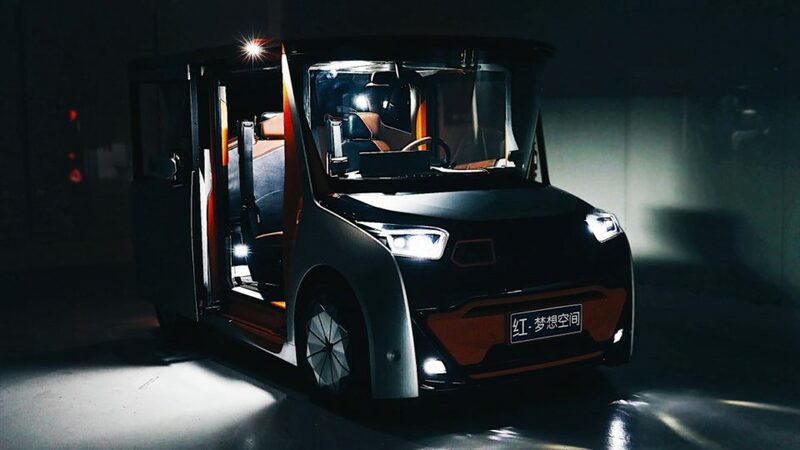 It looks like something Postman Pat might drive, but one of the world’s most influential car designers says REDS, or Revolutionary Electrical Dream Space, is the future of the motor vehicle. “There are going to be all cars up until REDS and there are going to be all cars after REDS. This is the turning point,” the car’s creator Chris Bangle declared at its Los Angeles Motor Show launch on Friday. It would be easy to dismiss these declarations as mere motor industry hyperbole, but Bangle is renowned for his unorthodox and innovative designs. The 61-year old American’s CV includes stints with General Motors, Fiat and 17 years with BMW, where his ‘flame surfacing’ styling language generated huge controversy and is now credited with reshaping modern car design. REDS creator Chris Bangle is an auto industry veteran. He quit the auto industry in 2009 to start his own design consultancy, but was commissioned in 2014 by the Chinese government-owned transport company CHTC Motors to create an electric car for China’s gridlocked megacities such as Beijing and Shanghai. REDS is under three metres long, rear-engined, has a tiny turning circle and seating for four, or five when stationary. The key to understanding the wacky exterior design is that REDS was designed from the inside out because cars spend 90 per cent of their time idle and only 10 per cent moving. “We think of cars as moving objects, but they really aren’t. They are stopped most of the time,” Bangle said. The REDS is specially designed for cramped urban life. That helps explain the curious convex windscreen, which is shaped so the steering column can be folded forward out of the way when the car is not moving. Reversing the windshield rake also stretches the roof, which allows more solar panels to be fitted to power air-conditioning and other accessories without draining the driving range of the car. Inside, the seats slide back forth, rotate, fold, tilt, narrow and expand. An information screen on the dash can pop up to a full 17-inch monitor for watching movies and playing games. There’s a foot massage for the front passenger and access to the cabin is via sliding doors. The REDS can seat four, and the driver’s seat can rotate 167 degrees even when the doors are shut. Even by Bangle’s outlandish standard this is a challenging vehicle. But he says it’s almost childish look and features such as the ability to easily change the colour via different body panels will win buyers over. “My hope and belief is people will say ‘I really like the character of this car’ and then the USPs of all the functions inside, well they really sell themselves,” he said. “I really think the variability of this car is going to make it attractive to people. Bangle and CHTC Motors won’t have that long to wait to find out whether REDS does have public appeal as it should go on sale within two or three years.